"The Town of Wakefield's municipal gas and light plant has operated from this location on Railroad Avenue (now North Avenue) since the community purchased the land, plant and manufacturing operations from the Citizens' Gas and Light Company in 1894. 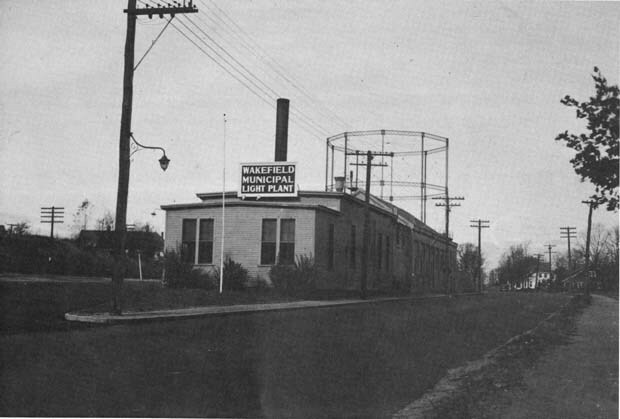 Gas was manufactured and stored in a gas holder at the facility until December 11, 1926 when the community began receiving gas from the Malden and Melrose Gas Light Company. This decision was reached by Town Meeting after 21 months of study and a series of close votes. During World War II, a Wakefield Salvage Committee was created after Governor Saltonstall asked each motorist to turn in old license plates and each community to begin collecting scrap metal, paper and rubber to supplement the raw materials needed for defense. Through a town drive in 1942, Wakefield residents collected 50 tons of scrap metal at the DPW yard. The following year, the MGLD dismantled the huge gray gasometer which had not been in use since 1926, and turned in more than 78 tons of metal for war salvage. Town Meeting voted in the early 1950's to erect a new building at the North Avenue site to replace the original structures. This involved the removal of all buildings. More than 40 tons of buried iron and steel were also removed when the buildings were dismantled. The following year, 1952, natural gas replaced manufactured gas, and in 1993, the Wakefield MGLD began fueling some of its converted vehicles with compressed natural gas at the North Avenue station." -- Text from calendar by Jayne M. D'Onofrio. “Wakefield Municipal Gas & Light Department, North Avenue, 1940,” NOBLE Digital Heritage, accessed April 20, 2019, https://digitalheritage.noblenet.org/noble/items/show/7147.